Below are figures from Chapter 3 of the Foresight Africa 2018 report, which explores six overarching themes that provide opportunities for Africa to overcome its obstacles and spur inclusive growth. Read the full chapter on human development and poverty trends in Africa here. On Thursday, January 11, the Africa Growth Initiative at Brookings launched its annual Foresight Africa report, focusing on key priorities for the region for the upcoming year. In chapter 3, Broadening the benefits of growth: No one left behind, scholars evaluate the region’s performance in improving human development outcomes and discuss issues like migration and food security. In his essay, Brookings Fellow Landry Signé discusses the relationship between economic growth and poverty reduction highlighting three key challenges: economic growth without adequate job creation, rapid population growth, and the lack of pro-poor government interventions. As Figure 1 shows below, half of Africa’s top 10 economic outperformers from 2000 to 2015 were oil-exporting countries where growth was mostly driven by natural resource exports. 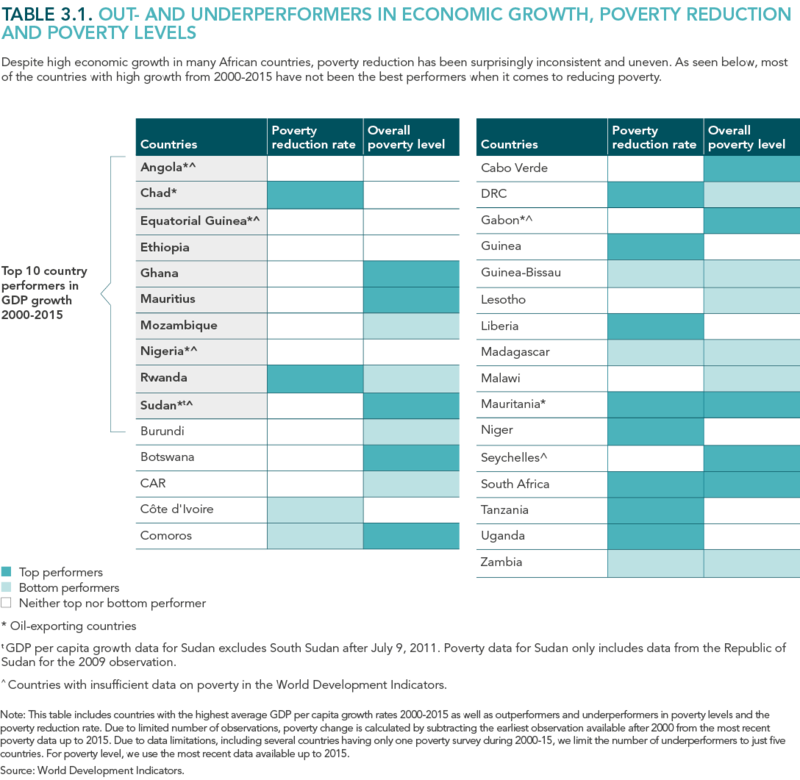 There is significant variation in poverty reduction with only two of the 10 economic outperformers also excelling in poverty reduction. Based on current projections, the region is not on track to end poverty by 2030 (Goal 1 of the Sustainable Development Goals (SDGs)). In his Foresight Africa viewpoint, Shanta Devarajan argues that universal basic income programs in oil-exporting countries have the potential to improve public spending outcomes through increased transparency and civic participation. The region is falling behind on other Sustainable Development Goals as well. 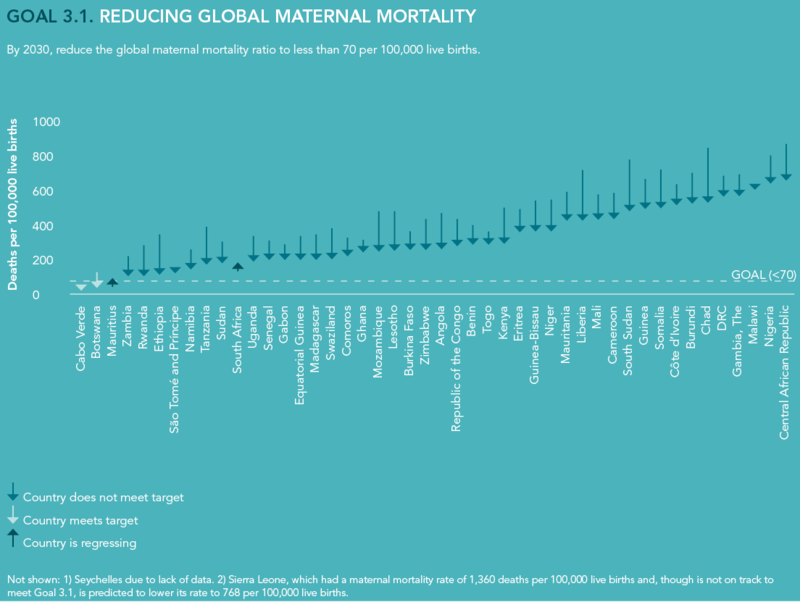 Figure 2, shows that only two countries in sub-Saharan Africa are on track to reduce maternal mortality to below 70 deaths per 100,000 live births by 2030 (part of SDG 3: Ensure healthy lives and promote well-being for all at all ages).